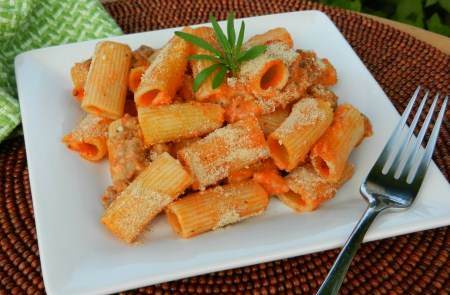 This baked rigatoni recipe makes a hearty pasta dish when combined with the sausage and cheese. 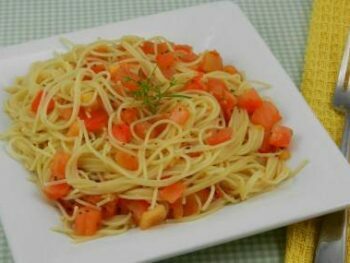 This is a great pasta recipe if the intended recipient has a large appetite. 1. In large skillet, brown sausage 5 minutes; drain fat. Add milk and flour; mix well. Add spaghetti sauce, whisk until well blended. 2. Bring to a boil over medium high heat, stirring constantly. 3. Remove from heat. Stir in pasta, cheeses, garlic, salt and pepper. 4. In 13×9 inch baking dish, place pasta mixture. Bake in 350 degree F oven, uncovered, 25 minutes. 5. Sprinkle with bread crumbs and place under broiler just to brown.